Sidney Slon/Pipe Dream Photographer Freshman forward Annie Ramil scored a career-high 13 points, completing all seven free throw attempts in a losing effort. 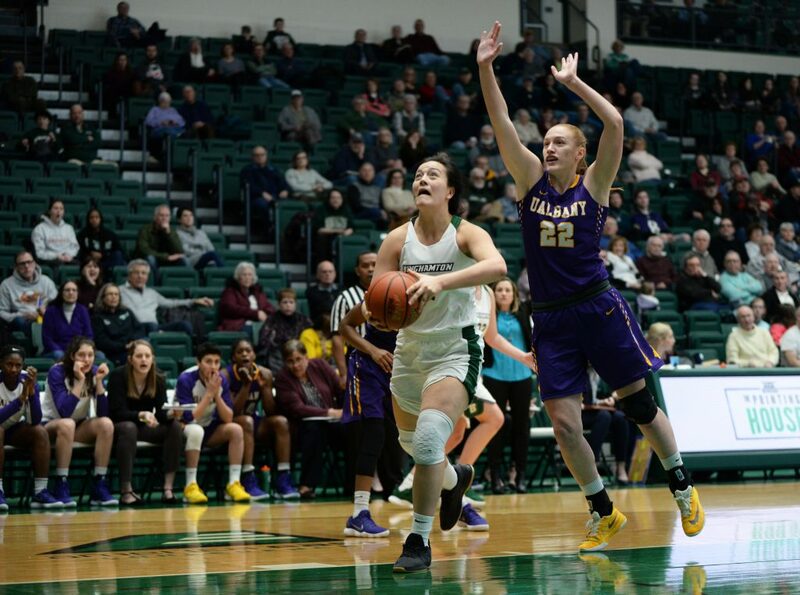 Coming off an impressive victory over first-place Hartford last Wednesday, the Binghamton women’s basketball team fell to Albany at home on Saturday. In a battle of two teams among the middle of the America East (AE) standings, the Great Danes (9-13, 6-3 AE) disrupted the Bearcats (9-13, 4-5 AE) with their length on both ends of the court, extending possessions with offensive rebounds and harassing BU defensively. While BU competed well for most of the game, Albany took the advantage in the second quarter and led for the remainder of the game, earning a 71-62 victory. In the first half, the Bearcats’ frontcourt was plagued by foul trouble. Sophomore forward Olivia Ramil started at center and committed three fouls in the half, and starting forwards senior Rebecca Carmody and sophomore Kaylee Wasco recorded two fouls apiece. This created the opportunity for some of BU’s bench to produce, and freshman guard Annie Ramil answered the call, putting up eight points in the first half. Despite the foul trouble, Binghamton fought hard to enter halftime only trailing by three, with Albany leading 29-26. BU opted for a smaller lineup in the second half, with junior guard Karlee Krchnavi replacing Wasco. As a result, Albany’s length began to put more pressure on BU, particularly on defense. The Great Danes’ big-to-big passing opened up the Bearcats’ zone repeatedly from the mid-range. Albany had a well-balanced offensive attack, with five different players scoring in double digits. Binghamton was again plagued by poor ball security, committing 19 turnovers in the game. Already leading the conference in turnovers, lackadaisical play has hurt the Bearcats throughout the season. Moon led Binghamton in scoring, totaling 20 points with five 3-pointers. Annie Ramil finished with a career-high 13 points, getting to the free-throw line seven times and shooting 100 percent from the charity stripe. Carmody played well despite foul trouble, scoring 17 points, grabbing nine rebounds and swiping four steals. Saturday’s loss drops Binghamton to sixth place in the AE standings, trailing Stony Brook and Vermont by only one game, adding pressure on the Bearcats to win soon to boost their seeding for the playoffs. After the Bearcats’ next matchup with SBU, Binghamton takes on New Hampshire, UMBC and UMass Lowell, who have currently combined for four victories in conference play, opening an opportunity for BU to rack up wins throughout February. The Bearcats return to action on Wednesday, Feb. 6 when they will take on the Stony Brook Seawolves. Tipoff is scheduled for 7 p.m from the Island Federal Credit Union Arena in Stony Brook, New York.